Last week I posted on Instagram that we were being presented to a birthmother and birthfather that are expecting a baby in December... the day before my birthday and two days after Nathan's birthday. We weren't feeling super strongly that this was our baby, but we decided to go ahead and be presented and let the Lord work that out. We found out this morning that they did NOT pick us to be their baby's family. So we wait for the next one. In the meantime, I have had several requests for us to re-open our t-shirt fundraiser. Apparently not everyone made the deadline. The only thing is that to re-open it and have a successful campaign, we have to sell 50 more t-shirts. We are VERY close to having all of the funds we think we will need for our adoption, so if you are interested in helping us get there this week then would you consider buying a t-shirt? THE DEADLINE THIS TIME IS OCTOBER 14TH... NEXT TUESDAY. You can visit our Bonfire Page to make your purchase. FYI... the "unisex" t-shirts basically mean that they are men's sizes that run about a size too small. So if you would normally wear a men's large, I would order an XL. 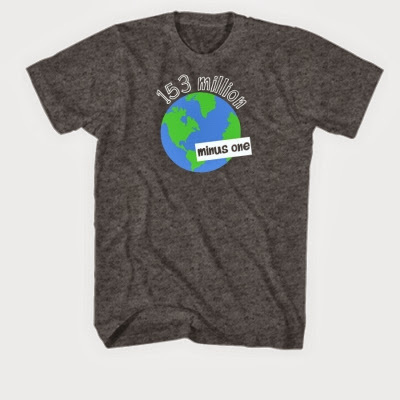 Then you can rock you shirt and tell the world that adoption is amazing! I love following along with your story. My husband and I are in the very beginning stages of adoption. As in we go to our first family interest meeting this month! 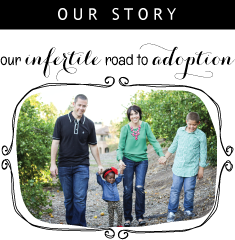 I have 3 full time step-kids, but feel like since we are having infertility issues, God is truly placing adoption on my heart. However, it is so, so scary and overwhelming and there is so much info out there. It's hard to even know where to start. The idea of open adoption scares the bejeezus out of me. So, I appreciate being able to read other peoples stories. Thanks for sharing.